Heat (500ml) oil in a pan; place cleaned prawns (1kg) deep fry for 5min. 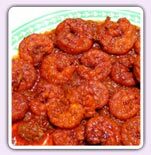 In a bowl take fried prawns (1kg), add red chilly powder (5sp), salt (3sp), mustered powder (1sp), fenugreek (methi) powder (1/2sp), turmeric (1/2sp), and boiled tamarind paste (100g) mix all the ingredients thoroughly. Heat oil (4sp) another pan; add chana dal (1sp), uraddal (1sp) fry for 1/2min. Now add red chillies (2), chopped garlic (2sp), mustered seeds (1/2sp), jeera (1/2sp), turmeric (1/2sp) and curry leaves. Remove this from fire and mix with the prawn’s mixture.